Why did I waste my time getting worried about meeting with MJ Gimbar and Rick Cook? They’re the fishmonger and executive chef, respectively, at BlackSalt seafood restaurant. That’s why. Fish. Seafood. Shellfish. Fruits of the sea. Mariscos. Pescado. Whatever you call it, I know a lot about it. 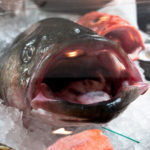 I was spokesman for a national seafood association and learned more about fish than I ever dreamed. I can pronounce listeria monocytogenes without missing a beat. I traveled to Seattle to visit a salmon farm in beautiful Puget Sound with government researchers. I got to see fish grown in tanks at hi-tech research facilities that are building sustainable fish farms to feed the world healthy protein – and use filtered waste from production to grow plants onsite. Cool, huh? As sophisticated as we are in the 21st century, many people – even chefs! 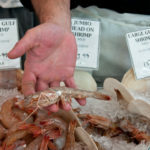 – don’t know how to cook seafood or store it properly or are confused by the issue of sustainability. So I always go into a conversation about fish with a certain amount of trepidation. But really, there was nothing to worry about. Because Gimbar and Cook know everything about fish. And I mean everything. MJ arrives at work daily around 5:30 in the morning. He talks to between eight and 10 distributors – some are fishermen – the day before he receives a shipment. They find him local and hard-to-find varieties. As fishmonger, Gimbar runs the fish market located in the front of BlackSalt, and that makes up about 70 percent of their business before 5 p.m. In the evening, 80 percent of BlackSalt’s business comes from the restaurant and bar. On an average Saturday night, Chef Cook expects to serve 350 guests. Ever dreamed of walking into a seafood restaurant, pointing to a grouper, saying, “Grill it for me!” and getting that perfectly grilled grouper delivered to your plate as you sip a glass of wine? Dreams do come true. And they happen at 4883 MacArthur Boulevard in D.C.’s Palisades neighborhood, folks. At a media lunch sponsored by BlackSalt, I enjoyed grilled skate with Brussels sprouts and lentils. Delicious doesn’t begin to describe it. And why skate? Well, I knew I wanted to try something I wouldn’t cook at home. Cook said that many people bring that same attitude to his dining room nightly. So it stands to reason that he practically lives at the restaurant. “Working long hours is the price I pay for a great job with cool people,” he said. Cook and Gimbar also know a damn sight more about fish than most people do, even their counterparts in the industry. 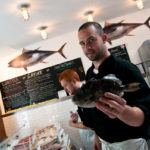 Their knowledge of seafood sustainability goes beyond the trendy iPhone app and deep into waters of ever-changing science. Basically, the challenge with labeling one fish as “sustainable” and another as “unsustainable” is that wild fish stocks change all of the time based on ecological factors. 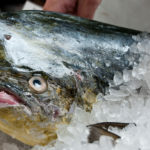 Gimbar quoted sources such as the Blue Ocean Institute – “other seafood programs aren’t as strong on the science” and the U.S. government’s FishWatch program. Gimbar came to D.C. from New York where he first ran a small fish market and then worked as a wholesaler who dealt with New York City’s finest white tablecloth establishments. “I could name drop with the best of them.” He didn’t. I liked that about him. I asked about oysters, given that diners get excited about enjoying bivalves on the half-shell, especially the local variety from the Chesapeake Bay. That’s what I hear, anyway. I’m not an oyster fan. Gimbar agreed, except for the part about oysters from the bay. “Oysters are like wine,” he explained. “The pristine cold waters in Canada produce the best varieties due to the salt content and minerality of the waters. I’m a firm believer in acquired taste for oysters in the Mid-Atlantic.” To support local fishermen, they buy local, but Gimbar prefers oysters from British Columbia, Massachusetts and Washington State. 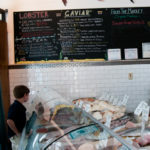 Cook sources produce from farms in Pennsylvania and Virginia and Maryland. I asked what we could expect to see on his menus and at the markets this time of year. He said to keep an eye out for tomatillos, hot and sweet peppers, eggplant, okra, gooseberries and currants. Chef Rick recommends, “With local fresh produce, the less you do the better.” After gently sautéing my farm-fresh zucchini from the Columbia Pike Farmers Market this past weekend in a little salt and oil, I agree. 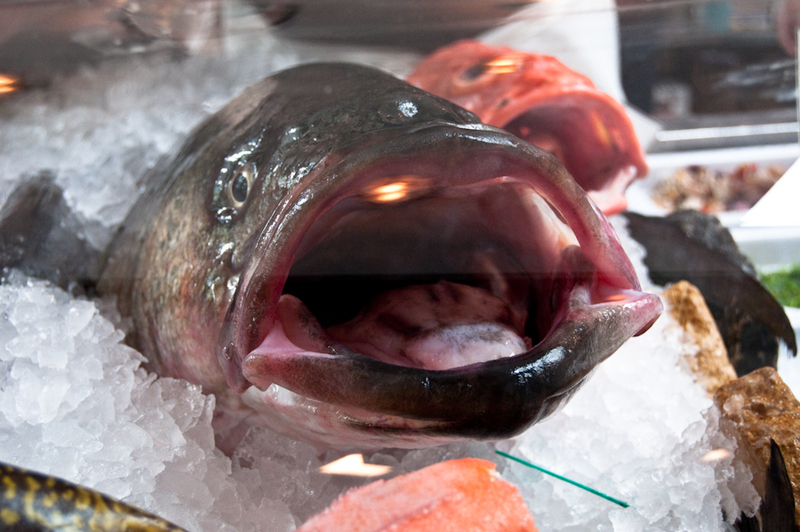 As for fish in season, Gimbar said to watch for wild salmon, halibut, fluke, tilefish, and a Mid-Atlantic favorite, blue crabs. Soft- and hard shell crabs should be available through October. Of course, you remember that from our post published last September, don’t you? It was that sort of measured response I quickly came to expect after not quite an hour chatting with Gimbar and Cook. “At BlackSalt, we’re honest, professional and provide quality that we can stand behind.” And by maintaining a reliable supply of seafood for future generations, the team at BlackSalt will be able to keep feeding us delicious fish meals. Look at the cleanliness of the store. Knowledge of staff is the most obvious indicator of whether you’ve found a reliable shop. Engage them in conversations about the fish. Ask where things come from. 3-5 p.m. Tickets: $55 per person in Advance, $65 per person at the door. Call (202) 342-9101 or visit www.blacksaltrestaurant.com for more information.